Earlier tonight, I finished up a meeting with the heritage committee of the Town of Bay Roberts. We went over the commemorative text for the bronze plaque that will mark Cable Avenue as a Registered Heritage District. Last year, the Heritage Foundation of NL designated the avenue, and helped to celebrate its 100th anniversary; this year, we'll install a large bronze plaque to mark the avenue's historic and architectural significance. We've tentatively set the first weekend of August for a formal plaque unveiling. Stay tuned for your invite! 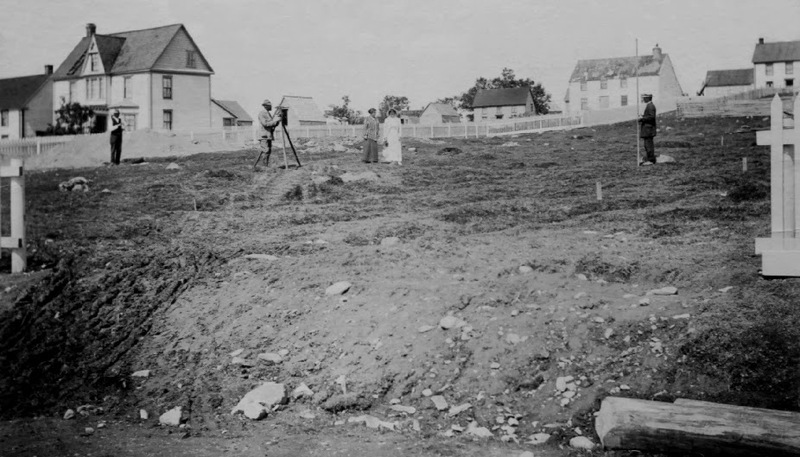 Photo: Surveying site of superintendent's house, August, 1913. From The Cable Building Story.